Artesis, a leading supplier of intelligent predictive maintenance solutions, has recently partnered with marine specialists James Fisher Mimic to integrate its Motor Condition Monitor (MCM) solution with the marine company’s industry leading Mimic condition monitoring system. The powerful combination of technologies has resulted in a highly efficient and unparalleled maintenance solution that is specifically targeted at inaccessible, high cost, critical assets in the marine sector. James Fisher Mimic (JFM), providers of reliability engineering and condition monitoring solutions to the International Shipping Industry, has fully integrated the Artesis MCM solution to analyse motor current performance within their Mimic predictive maintenance product. This detailed information, in conjunction with other maintenance data, then provides an in depth analysis and overall picture of machine health and performance. The wireless methodology of the MCM solution is of particular importance to JFM’s customers. Through the use of intelligent comms, it is ideal for high cost equipment such as motor driven assets onboard ships that are completely inaccessible but still require condition monitoring. The wireless solution allows the monitoring of such equipment to take place in an electrical switch room, providing constant and reliable, remote monitoring. 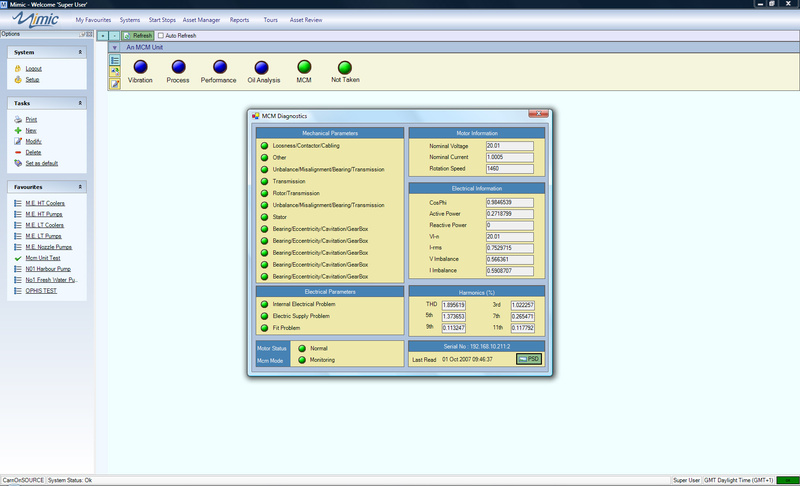 Since the integration of MCM technology into the Mimic condition monitoring system, interest from James Fisher Mimic’s users has been vast and varied; particularly with cruise line companies, for whom this technology would offer significant benefits in the monitoring of machinery space ventilation fans. These particular assets are critical to the performance of onboard machinery and have an impact on the operational commitments of the vessel. Failure in these fans would involve high-cost cranage bills, lost revenue due to unplanned down time, as well as ultimately loss of customer credibility. The ability to monitor the performance of assets such as these and be alerted to potential faults long before it breaks down saves time, spare parts, prevents secondary damage and significantly drives down maintenance costs. The Mimic Software Suite is a condition monitoring system that identifies the optimum time to conduct maintenance activity, which in turn realises savings by reducing downtime for unexpected repairs. Mimic ensures maintenance decisions are driven by the condition and performance of the assets. With a 22 year history of working within the marine environment, Mimic is used by companies such as the Royal Navy, Euroship, P&O Cruises and Ocean Village and offers significant advantages over conventional systems. Mimic achieves savings in maintenance costs, classification surveyor costs and traditional maintenance work can be significantly reduced. The James Fisher Group of companies provides a cohesive range of specialist marine services, which offer practical experience, innovation and commercial best practice to support all clients’ projects and services. The company delivers a broad range of marine services from bases around the UK and in Scandinavia. Presence in overseas markets continues to develop in order to provide quality local services to all customers. James Fisher is proud of its history as shipowners and operators and the continuing development as marine service providers. Artesis is a leading supplier of intelligent predictive maintenance solutions and has been offering its reliable and efficient range of products since 1999. Its technology has helped many customers around the world increase productivity and reduce maintenance costs. The Artesis team combines extensive experience in advanced product development with the successful application of advanced technology to the requirements of operations and maintenance professionals. Artesis manufactures a range of intelligent condition monitoring products including the Motor Condition Monitor (MCM), and Plant Condition Monitor (PCM) instruments, and the MCMSCADA software package. These products are used for plant monitoring, predictive maintenance, and process optimization across multiple industries including the chemical and petrochemical, metal processing, power generation, pulp and paper, water, utilities, cement, food and beverage, automotive, textile, and maritime sectors. Artesis has a robust intellectual property portfolio of issued and pending patents internationally.